Provide comfort for the family of Ruth Theiss with a meaningful gesture of sympathy. Ruth H. Theiss, 86, died on April 4, 2019 at Our Lady of Mercy Life Center in Guilderland. She had lived in Ballston Lake, Fishkill, Hughsonville, East Greenbush, Greenfield Center, and New Berne, NC. Born on April 20, 1932 in the Bronx, Ruth was the daughter of the late George and Helen (Weiss) Young. Her family later relocated to Dutchess County. On October 19, 1952 in Fishkill, she married her high school sweetheart Robert E. Theiss who predeceased her in 2015 after 63 years of marriage. She was employed as an executive assistant at IBM in Poughkeepsie, East Fishkill, and Albany, and also ran operations for a Wilton candy making shop. Ruth enjoyed fishing, golfing, knitting, and doing crafts. She loved to travel and had a passion for dogs. She was also proud to have physically helped her husband with the construction of their homes. 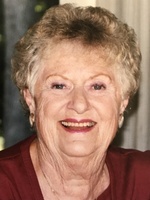 She is survived by her sons and their wives, Robert and Nanette Theiss, Steve and Jeanne Theiss, and Neil and Gaye Theiss; her grandchildren, Crystal and William Gannon, Eric and Jamie Theiss, Jordan and Matthew Nagelschmidt, Jonathon and Lyndsie, Gregory, Alexander, and Ariel; her great-grandchildren, Molly and Reagan; her sister, Carol Cooper; step great-grandchildren, Zeynep , Jayden and Nathan; and many nieces and nephews. Visitation will be held on Saturday from 10 am – 12 pm at the McHoul Funeral Home of Fishkill, Inc., 1089 Main Street, Fishkill. The funeral service will be held on Saturday at 12 pm at the funeral home followed by burial at Fishkill Rural Cemetery. Donations may be made in Ruth’s memory to ASPCA or Humane Society. Please visit her Book of Memories at www.mchoulfuneralhome.com. Consider providing a gift of comfort for the family of Ruth Theiss by sending flowers.